Rotary in support of disabled athletes. An Ironman Challenge is being taken up as his latest feat by well-known Fermanagh dentist James Hamill, who is no stranger to going the extra mile and demonstrating his sporting prowess for good causes. James, the Principal of Blueapple Dental and Implant Team in Belcoo is using the Challenge as an opportunity to support Rotary charities and in particular those in our community who have disabilities. 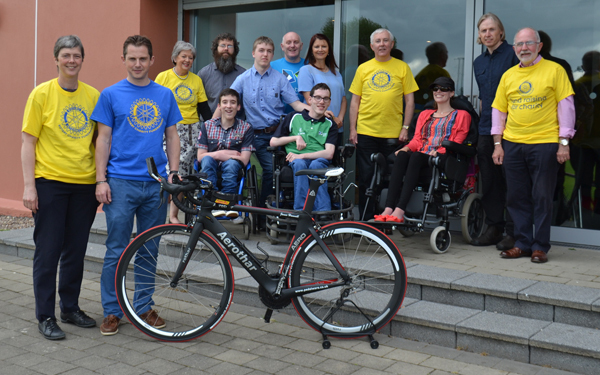 On Friday evening 26th June 2015 the Rotary Club of Enniskillen hosted an event in Fermanagh House promoting awareness of disabled athletes at which James gave an outline of the triathlon event which he will enter on July 19 in Bolton, in the North West of England. 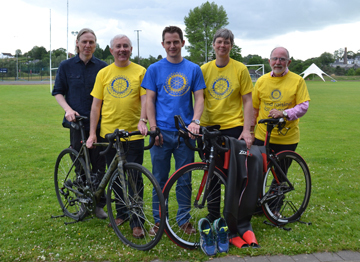 He reflected that earlier in the year the Rotary Club had pledged its support for disabled athletes and was privileged to be present and speak to local athletes of the Fermanagh Sports Disability Team and their trainer Joe Graham. During his time competing in various events throughout the UK and Ireland James had been personally challenged by entrants with disabilities competing alongside able bodied athletes. Whilst there was an opportunity give some financial support, James said 'public awareness in support of their determination and skill was of equal importance'. Those attending the Fermanagh House Event had the opportunity to view equipment used by the Sports Disability Team and compete in a game of Boccia Ball similar to the French game of boules. Robert Wilson of Pedalware cycle business based at Lisbellaw, Co Fermanagh and supplier of custom built bikes was present and brought along examples of his cycles. He answered questions in relation to adaptations suitable for athletes with a disability. Rotarians and the public are invited to support James in his Ironman Challenge and subsequently Rotary Charities by subscribing online to his 'JUST GIVING' account.